Other than the cast, which isn’t exactly good, it’s just name-studded, there is nothing remarkable about Our Idiot Brother, making it a movie that barely has a story, a comedy that isn’t all that funny, and basically a film that never needed to be made. I like Paul Rudd and his ageless charm as next as the next warm-blooded human, but he never has been and never will be talented enough to be the vehicle of a movie; even as Ant-Man he’s not strong enough to tackle the job himself. He’s Josh from Clueless, he’s Wally from Cider House Rules, he’s Mike from Friends, he’s Bobby Newport from Parks & Rec, he’s That Guy from countless throwaway comedies, but he’s not a leading man, and never will be. He especially can’t helm a stupid semi-rom/com with more name actors than a Wes Anderson flick, especially when it’s this poorly made. Ned is a serial optimist who never gives enough credit to the negatives in life, although he has experienced enough of them firsthand. Recently, he’s been in jail for selling weed to a cop he thought needed a helping hand, and his girlfriend both kicked him out of his house/commune/garden and took his dog, Willie Nelson. So Ned is now homeless, helpless, and hopeless, as kind as they come but not too bright about the more wicked ways of mankind. His sisters take him him one by one; Miranda the career woman, Natalie the artsy lesbian, and Liz the homemaker. They each try to change Ned into someone more responsible, but they are each changed themselves as his sunny disposition affects all around him, even when his much-too-honest mouth gets him into serious trouble. 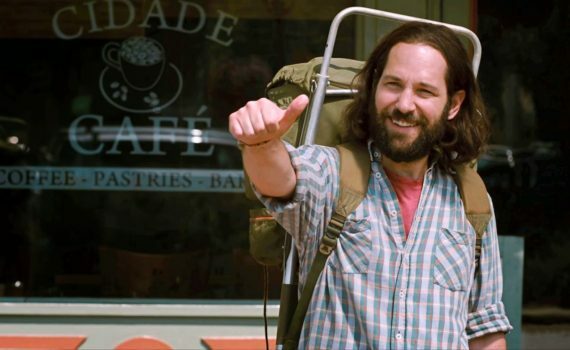 I like Paul Rudd, as I said, and he plays a hippie pretty well, refusing to cuss and always trusting others; it’s a fun role. But that’s it, that’s where it ends, there’s nothing else either funny or strong to report from basically the beginning of the movie on. The only thing that’s interesting about this movie is its cast, which is impressive, but not really high-quality: Paul Rudd, Elizabeth Banks, Adam Scott, Rashida Jones, Zooey Deschanel, Emily Mortimer, Steve Coogan, Kathryn Hahn, T.J. Miller, Sterling K. Brown, Hugh Dancy. The best is probably Miller or Brown, the worst is definitely Emily Mortimer, who can’t play an American to save her life. But no one did anything funny, there was way too much of a “message” here, much more than a comedy of this caliber deserved, and the moral never really came across anyway. What we were left with was a dumb plot, unnecessary conversations, and a central figure who was, at best, completely unbelievable. I blame myself for voluntarily watching this film, probably because of the Parks & Rec reunion, when the red flags were waving madly all the while.